You are at:Home»Cruise Ships»How Do Cruise Ships Work? Cruise ships are a fantastic way for couples and families to combine a wide range of activities and fine dining with exciting destinations and unforgettable experiences. But with so much to see and do on board, not to mention all the people, luggage and supplies, modern day cruise ships must bear a huge burden that goes beyond the weight of the actual ship itself. So what makes your amazing cruise ship experience possible? Weighing a staggering 225,282 gross tonnage, it’s remarkable how Royal Caribbean’s Allure of the Seas, the world’s largest cruise ship, can not only stay afloat but reach an impressive speed of 22.6 knots, equivalent to about 26 miles per hour. The fact that ships like this are able to stay afloat is down to the principles of buoyancy and displacement. Ships displace an amount of water equivalent to their weight as they push down on the sea, and at the same time, the sea pushes up, keeping the ship floating. The shape of the ship and the materials used in its construction also help it to achieve buoyancy. Strong, lightweight materials are utilised in a design that aids displacement. The hull, or body of the ship, is rounded and designed so that the weight of the ship is dispersed across it. The hull is often U shaped, pushing water out of the way, dissipating drag, and ensuring that you and your fellow cruisers have a smooth ride. Modern cruise ships are now built to withstand a wide range of natural hazards from sandbars, reefs and sharp objects to dreaded icebergs. Some ships have double hulls for extra strength and the mega cruise ships also have bulkheads. Bulkheads are vertical dividers that are watertight and should the ship be damaged, they help contain incoming water into compartments to minimise flooding and ensure the ship does not sink. Most modern day cruise ships use either gas turbine or diesel electric engines to keep them moving across the sea and to power their systems. As you might expect, the larger the ship, the more power hungry it is. In fact, very large ships may even have more than one power source, with one dedicated to propulsion and the other keeping the systems running. Whatever engine is used, ships need a lot of fuel to keep them running. 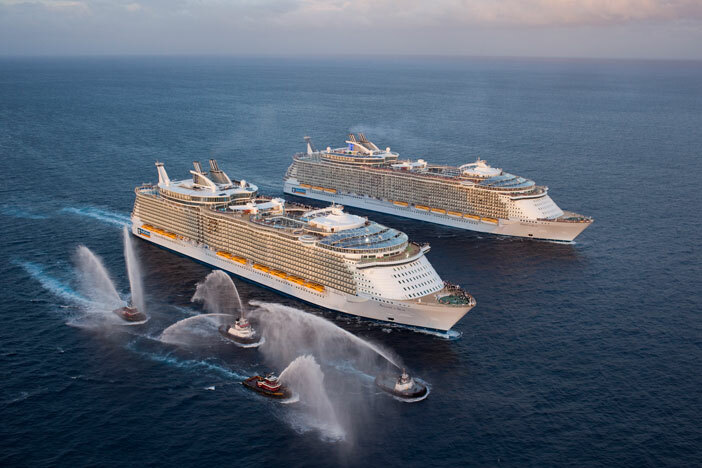 Oasis of the Seas, the world’s second largest cruise ship, has three 16-cylinder engines and three 12-cylinder engines. The 16-cylinder engines consume a staggering 1,377 US gallons of fuel per hour each at full power, and the 12-cylinder engines consume a further 1,033 US gallons of fuel per hour each at full power. Since many mega cruise ships like this will be travelling for 10 or 12 days at a time, they may need to fill up at ports along the way, although some have been built to carry enough fuel to sail nonstop without refilling. Although the ship’s engines provide the power, it is the ship’s propellers, or ‘screws’ that push them through the water. Cruise ship propellers actually turn quite slowly in comparison with aircraft, and rely on brute power rather than speed to work. Older ships need rudders to steer the propellers but modern ships utilise newer technology. For example, the Oasis of the Seas uses three 20,000 kw azipods which are electric azimuth thrusters containing electric motors to drive its enormous 20-foot propellers. Because the azipods can be rotated, the ship does not require a traditional rudder in order to steer it. It also has four 5,500 kw transverse bow thrusters to assist with docking. As well as pushing the ship forward, the thrusters help to keep it safe. If the ship encounters a hazard, it can be quickly turned to avoid it. Had the Titanic had azimuth thrusters, the story might have been very different from the tragedy that we know so well. In the unlikely event that something should go wrong and the ship ends up dead in the water, all ships are installed with an emergency generator to ensure that electricity is maintained and the ship’s vital systems can still be used. The generator is always located high up in the ship away from the engines so that it is less likely to sustain damage. Large ships will frequently have two or possibly more emergency generators, and usually a battery backup too. Modern day cruise ships are incredible feats of engineering and next time you’re relaxing on deck, sipping a mojito and enjoying the peaceful lap of the waves washing across the hull, remember that far below you, powerful engines, complex computers and futuristic thrusters are working hard to take you to your destination and keep everything running just the way it should.